Each summer dozens of college students from around the nation travel to UMBC to take advantage of the university’s leading research facilities and faculty. This year, 28 students studied climate change, diabetes, and other topics as part of UMBC’s Interdisciplinary Program in High Performance Computing, a Research Experience for Undergraduates (REU) housed in the mathematics and statistics department. At the same time, 10 students tackled projects through the new Chemical Sensing and Imaging REU, hosted by the chemistry and biochemistry department. Students learned new scientific skills, refined career goals, and practiced teamwork. The interdisciplinary projects have exposed students to new options. “People don’t think about how math can overlap with other things,” says Danielle Sykes ‘19, mathematics and statistics and a Meyerhoff Scholar, whose team applied a data analytics model to huge amounts of climate data from across the Missouri River Basin. “It’s definitely expanded my thinking about what my career options are,” she shares. The National Science Foundation, Department of Defense, and National Security Agency all contributed funding for the program this year, enabling a larger student cohort to participate. Fifty percent of students come from institutions with limited research opportunities, so the program gives them rare first-hand experience and helps them decide if they’d like to pursue research further. A graduate student and faculty member are assigned to each undergraduate team, “so teams can be really well supported,” says Gobbert. UMBC’s new chemistry REU “embraces the UMBC mission to provide research and education opportunities to students from all backgrounds, including students from underrepresented minorities in STEM,” says Zeev Rosenzweig, professor and chair of chemistry and biochemistry. Supporting these students is a team effort. “I greatly appreciate the dedication of our UMBC faculty and graduate student mentors to the participating students,” he says. The 10 students in the program had eye-opening experiences in their research projects. “I’ve gained an appreciation for the principal science behind a lot of the things we use,” says Kalen Sullivan, a pre-med student at Iona College who worked with Marcin Ptaszek, associate professor of chemistry and biochemistry. Sullivan didn’t meet his project’s goal to produce a specific novel compound in the lab, although he worked long and hard, but he’s found an even greater respect for people who work “in the trenches” of science. Kathy Barron, a 2016 chemistry graduate from Virginia Tech, worked with Jennie Leach, associate professor of chemical, biochemical, and environmental engineering (CBEE), and Erin Lavik, professor of CBEE. “I thought it would be a good opportunity to learn about a field of research I was unfamiliar with,” she says. It went so well that Lavik asked her to stay on after the REU ended. She’ll continue doing research in the lab and is considering graduate study in the same field. 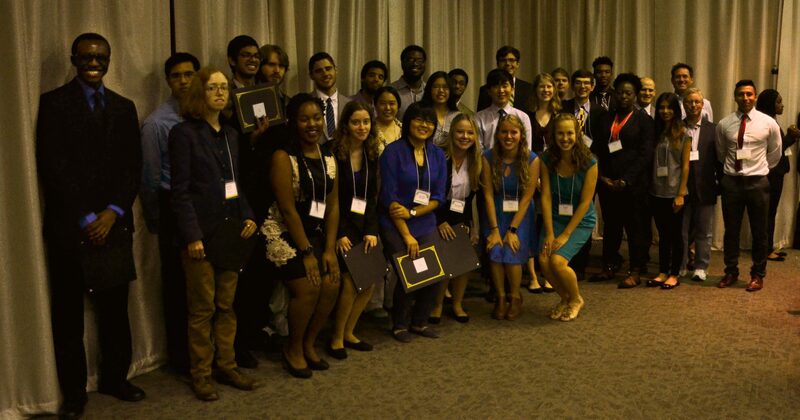 All UMBC REU students presented their work at the 19th annual Summer Undergraduate Research Fest on August 10. Banner image: 2016 Chemical Sensing and Imaging REU cohort at SURF. In-text image: 2016 High-Performance Computing REU cohort at SURF. Photos by Tim Ford for UMBC.